This is a nautical inspired anchor address plaque. Two line anchor arch marker. Whitehall address plaques are made of recycled, rust-free, cast aluminum, and finished with durable, weather-resistant finishes. Arch design with raised anchor image. 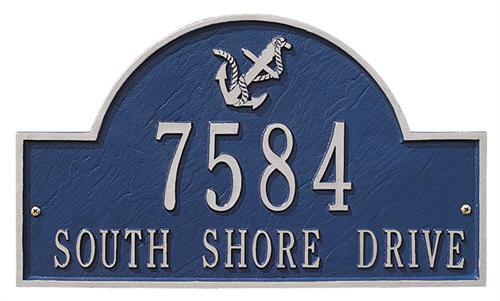 Anchor address signs are handcrafted in Michigan by Whitehall Products. For over 60 years, Whitehall has been crafting personalized name and address plaques to provide a distinctive finishing touch to homes across the country. 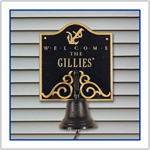 Whitehall is the world's largest manufacturer of personalized name and address plaques. Line 1 holds up to five 3'' characters. Line 2 holds up to seventeen 1.25'' characters.